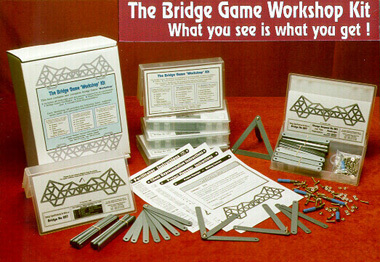 The Bridge Game is available for outright purchase as a turn-key learning tool. It requires very little initial prep time and no set-up prior to sessions. It’s designed with the Learning Professional in mind and ready to start working for you when you open the box. The complete Bridge Game Kit shown on this panel, provides all you need to facilitate a workshop of about 35 participants. It contains all the hardware materials, drawings and role-play documents required for all 5 teams to each build their bridge. For larger groups, additional kits may be ordered to accommodate your numbers. We have facilitated workshops of well over 100 participants. The kit also includes a very clear and concise set of Facilitator Guidelines, suggesting different ways to run the exercise, while allowing you great flexibility to use a style that is comfortable for you. And, we have added many hints and ideas reflecting typical real-life business situations, which will help you in making this a very challenging and highly enjoyable session with some good fun for all. Accommodates up to 5 teams of up to 7 players each. Is completely re-usable from session to session, i.e. no consumption, no deterioration, nothing else to buy. (Spare parts are included). A good traveling companion. Sturdy carrying box, measuring 9 x 11 x 4 inches; 23 x 28 x 10 cm; weight 5 Lbs / 2.2 Kg. Prices quoted include our S&H for Canada and USA. Canadian taxes are added where applicable. Volume & Repeat Order Discounts are available and open for discussion. Unconditional ‘Component Replacement’ warranty for one year. No User Licensing Restrictions imposed.